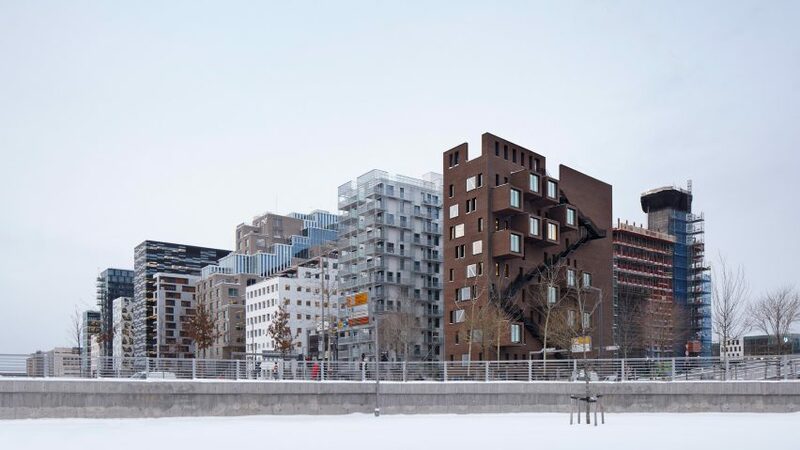 Meeting rooms cantilever from one side of this wedge-shaped office block in Oslo by Norwegian firm A-Lab – the final building in the city's waterfront Barcode Project regeneration scheme. 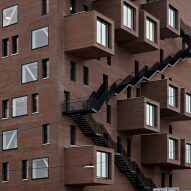 The red brick office block named Wedge is the last of 13 buildings to be completed on the Barcode Project, which has seen the regeneration of a former docklands in the city. 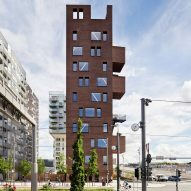 It accompanies A_Lab's mixed-use hollowed out tower, MVRDV's pixellated bank and Dark Arkitekter's staircase-inspired office tower. 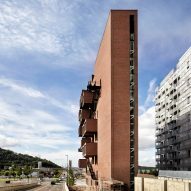 Made with red brick to contrast its neighbours, the 11-storey building occupies a wedge-shaped plot on the east of the site. Because of the shape of the site, the office spaces narrow from 10 metres wide to just five metres wide, and so A_Lab projected volumes from the eastern side to provide extra space for meeting rooms. 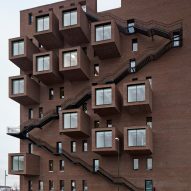 "Each floor has meeting rooms cantilevered out over the eastern facade, a space-saving feature that adds a lively architectonic quality," explained the architects. 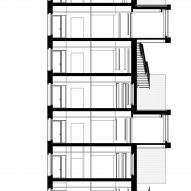 An exterior black stairway meanders between the boxes, adding extra character to the end facade. 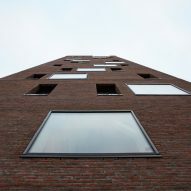 It is intended as a fire escape, an alternative route between the various floors, and to give access to the common areas in the top of the building. 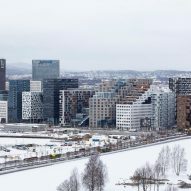 "A fire escape zigzags between these meeting-room boxes, further enhancing the building's iconic sculptural expression – facing the Mediaeval Park and the City of Oslo to the east, this is a fitting conclusion to Barcode's long row of facades," said the architects. 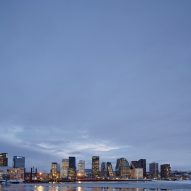 Floor-to-ceiling windows offer for views of the Ekebergåsen hill to the east, to the Oslofjord in the south and Bjørvika bay to the west, as well as naturally lighting the workplaces. The open-plan layout of the offices is intended to offer flexibility for the small companies with 15–35 employees who will occupy the spaces. Simple finishes like white-painted walls and wooden flooring are intended to create a light and airy interiors. 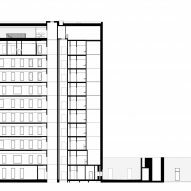 A number of communal facilities for workers feature in the building, including a restaurant and lounge area on the 10th floor and a roof garden planted with sedum. There is also a public restaurant on the first floor. "A healthy mix of enterprises will encourage multidisciplinary cooperation between the various professional groups, enhancing innovation," said the architects. "In this way, this modestly-sized building will actually promote greater diversity than will be found in many of the large multinationals that have their offices nearby." The basement contains showers, wardrobes, storage areas, bicycle parking, and parking and charging stations for electric cars. These facilities are designed to encourage eco-friendly commuting to work. 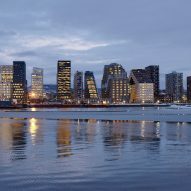 Founded in 2000, A-Lab's other projects include an office complex resembling a pile of horizontal skyscrapers and a business centre and offices at the former Oslo Airport in Norway.